Social Media Marketing can elevate your customer base in a very dramatic manner. Social media marketing is vital in building a base or foundation that will serve your brand and customers. Listening – We need to join discussions and read online content, to be able to create a good content and spark conversations that will add value to your targeted customer’s lives. Focus – A highly focused content marketing and social media strategy will help to build a strong brand that has better chance for success. Quality – Quality is always better than quantity. It is always better to have 1200 online connections who share, read and talk about your content rather than 12,000 connections who will disappear soon after connecting with you for the first time. Patience – Social Media Marketing does not guarantee success overnight. You need to be committed for a long time to achieve results. Influence – Need to find people who can influence your brand to quality audiences that would be interested in your products, business and services. This will put your business in front of a huge new audience. Value – You need to focus more on creating content and building relationship with online influencers, these people will help with word of mouth marketing for your business. Acknowledgment – Developing relationships is very important for the success of social media marketing, it is important to acknowledge every person who reaches out to you. Accessibility – Don’t just publish your content and disappear. You need to constantly publish content and also participate in conversations. Reciprocate – You cannot expect people to share only your content, you need to share content published by others too. You need to ensure presence of your business or brand is felt in the social space. With the right mix of analytics and creativity, we will create a brand campaign in a compelling and engaging manner that will attract your customers and drive your business to good results. We have a talented and experienced team who keep developing Social Media Marketing strategies that work very well. 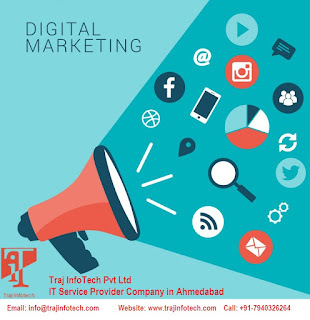 The demand for Social Media Marketing is on the rise mainly for two reasons, Firstly, ease of access due to the changes in technology and secondly, it is cost effective compare to traditional marketing. A lot of companies are opting for Social media marketing channels to promote and support their business activities. For any brand, social media is the best way to engage with your current and potential customers and also for a two way communication with them. With the right Social Media Marketing Strategy all your current and potential customers can successfully be converted into loyal buyers. It creates a connection with your customers, helps in educating them about your products and also exposing them to different aspects of your business. We create a Social Media Campaign to highlight your business goals at the same time ensuring that those goals are realistic, measurable, specific and time-lined. We provide Digital Marketing Campaign Services at Traj InfoTech Pvt Ltd.